See below for detailed information on sponsorship opportunities. Please contact Beth Warnick at bwarnick@cheat.org or (304) 329-3621 to select a sponsorship package for your company. Cheat Fest is our annual celebration that serves as the primary fundraiser in support of our work. The festival grounds are perfectly nestled along the banks of the Cheat River, just above the newly protected Canyon section – a stretch of river where whitewater enthusiasts flock to experience the thrilling rapids amidst a true wilderness setting. During the festival, attendees enjoy live music, an art market, a 5K and down river race, a vendor market, and more. Now in its 25th year, Cheat Fest draws up to 4,000 attendees from throughout the mid-Atlantic region and beyond. Festival-goers include: whitewater enthusiasts, environmental advocates, river lovers, fishermen, families, musicians, and artists alike. Cheat Fest comes to life thanks to the generous support of our sponsors. This ranges from monetary donations to help us obtain necessary contract services and materials for the festival, to partnerships that utilize the unique specialties of your business. 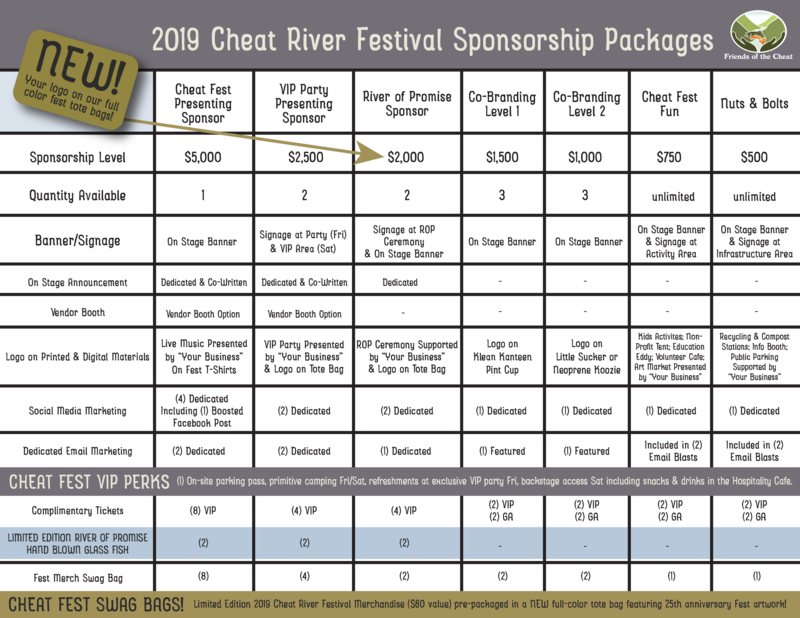 If you are interested in becoming a Cheat Fest sponsor, we would love to discuss how to create a mutually beneficial partnership between Friends of the Cheat and your business.